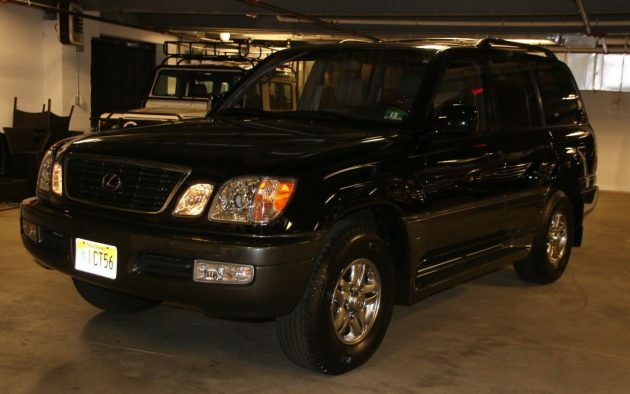 This 1k Mile Lexus Land Cruiser Has Hot History! Let’s start this story with a great number, 58. That’s the average number of miles driven for each year of this 2001 LX 470’s (the Lexus version of the FJ100 Land Cruiser series) illustrious life. Hard to believe, until you read the very interesting reason why, as found here on eBay. Our special thanks to reader Sean Johnson. This particular truck was stolen right off the dealer lot before being delivered to a customer. 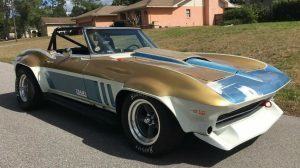 According to the seller, the cruiser was then directly stored inside a warehouse with nearly two dozen high value exotics. Although the whole collection was eventually recovered, the insurance companies had long paid out claims – making this (and the other loot) all salvage titles, but in title only. The owner assures that it’s a legal technicality – and the vehicle has been snuggly stored for its entire adult life, as evidenced by still having the plastic covering for the radio. Now you can own what must be “…the lowest mile FJ100/ LX 470 left in the world”, the listing proclaims. And they are probably right. A few minutes searching through the most common national databases for an equal – and I could not find any examples for sale under 15k miles. 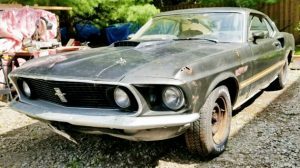 Perhaps, based on the unique history that led to such low miles, a museum or avid collector will be inspired to shell out big bucks for this low mile survivor. Considering the original litter of these puppies is a fairly small run (only 9,320 produced), the collectability of a rare, unused specimen might justify the price. Although I’m a fan of the Lexus brand overall, the citified version of the mighty Toyota Land Cruiser has never been my favorite. Give me a classic ‘63 FJ45 Cruiser Wagon any day and I’d be a happy man. 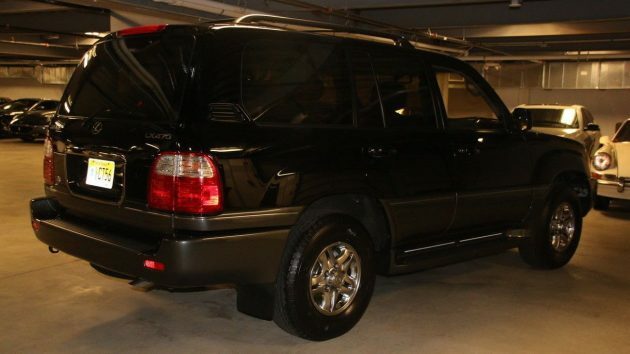 But, since technically the LX 470 is part of the family, it shares the same classic, rugged DNA as the ones I dream of. And this one, although stuck in time after of life of ill-repute, is still truly a one of a kind example for the right Lexus Lover. 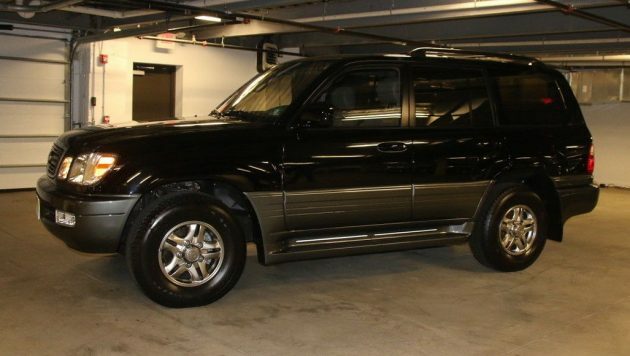 I’m sorry, but $140K (one “bid,” and “reserve not met”) for a Land Cruiser with leather interior plus different rims and badges? Yes, the market has been getting crazy, but this is really pushing it, Garr. If there are any Lexus fans out there who want to go after this (for a museum? Really?) I hope they’ll be pleased to know I won’t be in the bidding war…. Usually, I don’t like to put in negative comments, but this one takes the cake. Mr Barnum may have been right, but even he would be shocked by this one if it sells. The only one who made out on this deal was the guy who stole it in the first place. Maybe there’s a Russian mafia boss or a Saudi prince that can’t live without it. At six figures, I doubt there will be any takers. Stupid is as stupid does on this one! Where ya gonna find another one? But seriously, I’d talk to a lawyer before even bidding a paltry $100k just to make sure the legal formalities are cleared up. Now pass the caviar! Hey kids, lets go see that LX470! Check with your insurance carrier before buying this one. At my insurance company, the policy is, if the title says “Salvage” they will not cover it. I’ve been in the insurance business 40 years – a salvage title has not one iota of impact on a car’s insurability – it only becomes an issue should the car become the object of a claim because it is a significant factor in determining and negotiating value. As an aside, years ago I bought a Ferrari 308 GT4 with a salvage title due to theft. When I re-registered it in my name, I received a clean title! My current truck has been “totaled ” twice and duly reported as such to the DMV yet still has a “clean” title. The system has plenty of flaws. But back to the car at hand, I see no significant value to a very boring and pedestrian vehicle. Seller has no grasp of reality and hopes there’s likewise someone else but with far more money than brains. I have to partially but strongly disagree, these (and equivalent Toyota Land Cruiser) are among the best chassis of any SUV and certainly far more reliable and rugged than, say, a Range Rover. On the other hand, this 15-year old example with such low mileage will almost inevitably experience problems from lack of use, and I certainly do agree that the seller is dreaming. You could buy a new 2018 LX570 for much less. Maybe if he drops the first digit. 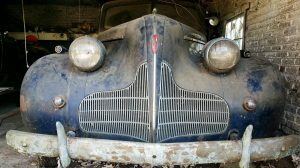 The dullest car I’ve ever seen on Barn Finds. A glorified Toyota, rare only that someone actually might lust after it. Ugh. I’m pretty sure the rest of them were sold here in the Dominican Republic. Natives here with money always buy the best of the litter. BTW, the 140K price tag is a normal price here with taxes. It says it’s in Short Hills, New Jersey, but it’s clearly from Shill Bid City at $140,000. ….more like Short Bus. The seller is nuts! I’m sorry, but this is about as far from the original “Barn Finds” concept as one could get, and a lot of stuff has come through here. ( including battleships and Russian jets) No offense, but I’d much rather see Scotty’s vintage Asian cars, many we can relate to, than this. Somewhere a piece is missing in this story. The vehicle has 1000 miles on it so someone drove it for a bit. Regardless of that fact it is way overpriced and he obviously has a rabbit (think greyhound racing) placing bids. 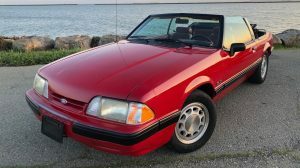 These are fantastic vehicles, and one in mediocre condition with under 100k miles will easily sell for $25-$30k in today’s market regardless of year. 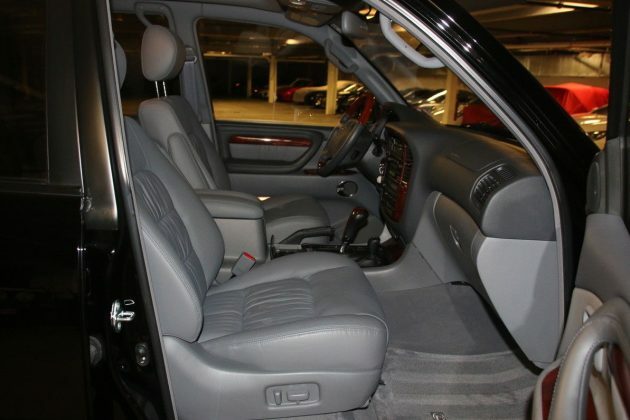 These are highly sought after, and are typically found with 200k miles or more on the odometer. Though this is a “new” car, it is a very well-made vehicle, possibly one of the best SUVs ever built. The price may seem ludicrous, but this is a car many will pay top dollar for in most countries, especially in almost-new condition. It’ll sell! Andrew- Based on the number of “Thumb Ups” (zero) I don’t think any of the regulars agree with your expertise or opinion on this one.Sorry! I agree with Andrew that it is one of the best SUV’s every built, but the asking price is insane. You could buy a brand new 2018 for much less. Roger, I don’t need you to agree with me, you simply need only to check the market on these. I’m not saying it’ll bring $140k, but it will sell! I know it isn’t a classic car, but there is an enthusiast base for these vehicles just the same. Pretty cool truck. its not a crazy price landcruisers are some of the most Iconic truck out there… I know of a similar mile Jeep Grand Wagoneer that sold over $200k and a Defender 90 with 400 miles that sold for $250,000. There are many landcruisers collectors outside the USA and this is likely the only one in the world in this condition. I am not buying it , too rich for me. ( wish I could afford it) But its not as crazy as it seems IMHO. I think at $150,000 there are probably many buyers, the real question is what is the reserve I wonder ? I bet some guy in Mid East buys this for a crazy number, they love these trucks out there . Cant wait to see the auction results! Cant wait to see the auction result! If you read the ad it clearly says it’s not a salvage title. It says that the “carfax” has a report of salvage after the insurance company paid it off. Being I know this industry well I can tell you this is true how it works. Carfax reports it this way once the owner is paid. This has nothing to do with salvage , hence the clear title. I thought this was Barn Finds, not Cars for the 1%. Even if the bidders that have pushed this to 145k (at the moment) are real, they must have brains incapable of logic. If you can buy one with 15,000 original miles, which should actually be more reliable than one with 1,000 miles, for 1/3 or 1/2 this price, it makes zero sense. I’m intentionally ignoring the museum angle because, well, that’s just silly. Just checked it’s over $145,000 now with 42 minutes left. There is someone for everything I guess.